California – Where is Ruthi? 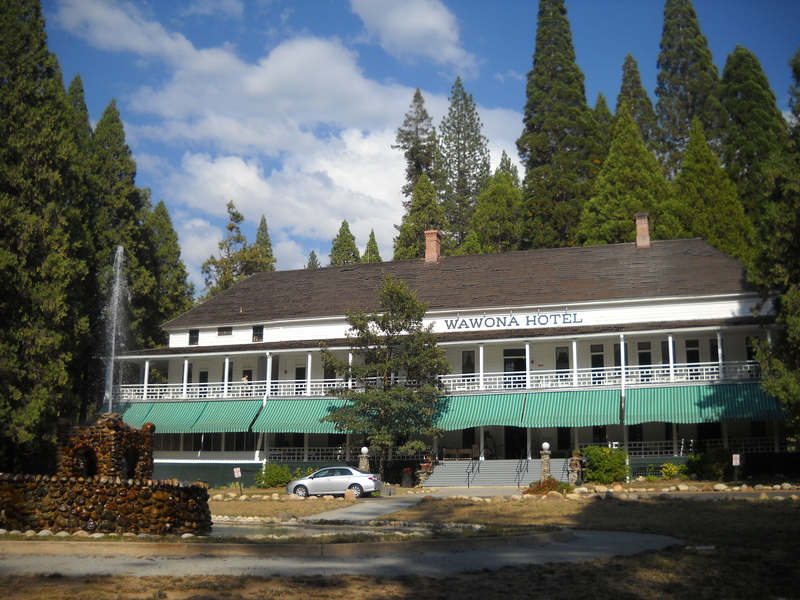 Nestled in the Wawona Valley of southern Yosemite, a stay at the Wawona Hotel, built in 1905, is a refreshing, restful respite after a challenging backpacking trek. 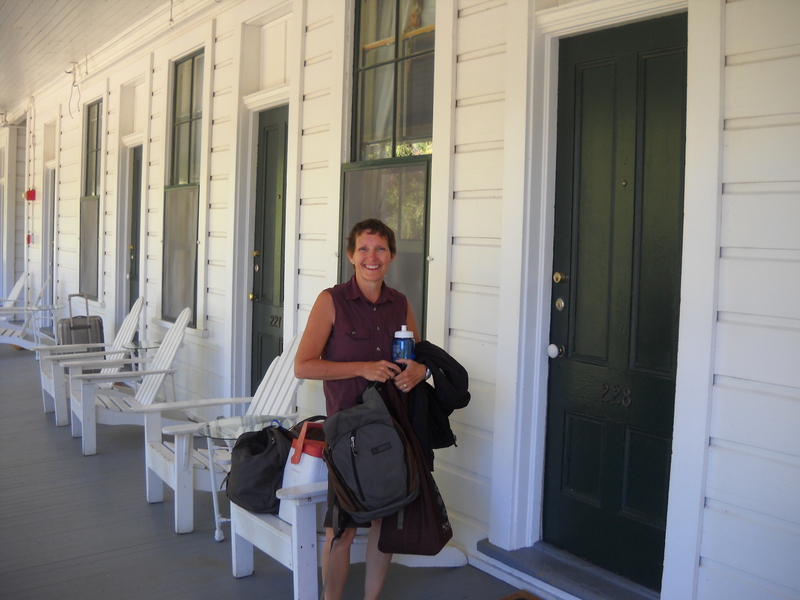 We stayed at Wawona for two nights following a 4-day Chilnualna Falls Loop trek. It is the perfect place to recuperate from tired feet and a hungry stomach. The rooms in the historic hotel are simple and small; just a square little space with a very comfortable bed, two nightstands, a bureau, and a chair. Our room opens on a shared balcony with a view of the front lawn and fountain. Each room has two Adirondack chairs and a small table on the balcony where we sit enjoying a hot cup of coffee and observing guests coming and going. The veranda stretches from one end of the hotel to the other with a slight little slant to the floor testifying to the age of this historic lodge. Sunsets are especially spectacular from this spot as the sun sets beyond the west side of the valley. There is a shared bathroom for most of the guests. The bathrooms are large with shampoo and soap dispensers in each shower. Bathrobes and towels are provided in the rooms making it easy to go back and forth from our room to the bathroom. Everyone walks around with his or her robe so no need for modesty. There are bins for the used towels and fresh towels are placed in the rooms each day. The Wawona offers an 18 hole golf course, a putting green, and a pro shop. Wi-Fi is available in the sun room above the pro shop. The golf shop has a small snack bar serving hotdogs, chips, and such. The golf shop also offers a free putter and ball to practice on the putting green. Every morning, included with each night’s stay, is a served continental breakfast that is quite large. Along with coffee and a choice of juices there are homemade breads, yogurt with granola, and fruit. This is all served in the cozy dining room with beautiful views of Wawona. Each night guests gather in the lobby, lounge, and front porch to enjoy after dinner drinks and listen to Tom Bopp on the piano. As we sit and relax, listening to the beautiful music and feeling the soft breezes filtering through the open doors and windows, we enjoy a cocktail appropriately named Chilnualna Falls to commemorate the completion of our backpacking trip.